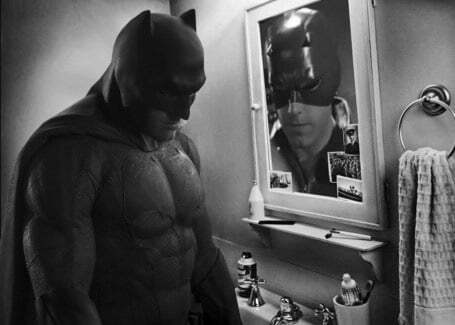 Yesterday morning, director Zack Snyder debuted our first look at Ben Affleck as the new big screen version of the Dark Knight in the untitled Batman vs. Superman movie. It was a very stylistic photo, taken in black and white with low lighting and plenty of rolling fog, and fully expressed what the tone of this new version of Batman will be. 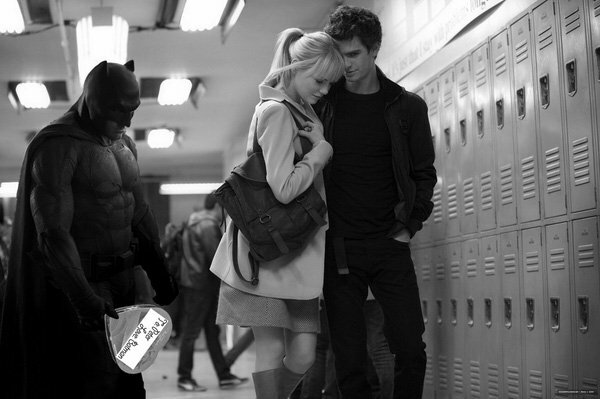 That said, the photo also makes the superhero look rather sad, and in the hands of the Internet that’s what you might call a comedy goldmine. They even have him jumping comic book universes and have him missing out on the chance to date Gwen Stacy from The Amazing Spider-Man. Stupid Peter Parker. Well, at least it saved him more loss in the long run. He's had enough of that for one lifetime. My favorite of all comes from SlashFilm, however. It’s a really funny Photoshop of one of Tom Hussey’s ‘Mirror’ photographs (featuring older people looking at their younger selves), and the reflection gag is clever. Which is your favorite? Let us know in the comments below and send yours to our official Twitter account!